So you officially have a walker. How exciting! … and also completely terrifying. A walking toddler means it’s time to kick your childproofing game into high gear. Let’s start with doorknob covers and locks. To prevent injuries. Curious toddlers just love exploring and opening and closing doors on their own. It’s all fun and games until someone accidentally slams their cute little fingers in the door, or gets them caught in the hinges. Toddler sleep training and safety. After kids transition from cribs to “big kid beds,” you want to make sure they stay safely in their own rooms all night (i.e. not wandering the halls, going downstairs for a midnight snack, or coming into your room approximately 97 times per night…trust me on this one, I’m speaking from experience!). When it comes to doorknob covers and locks, there aren’t a ton to choose from, but there are a few different types. You want to start by determining what your needs are (do you have round doorknobs or levers? Do you own a pet who needs to be able to get through? etc. ), and how McGyver-ish your child is (don’t laugh–some kids have serious skills and strength…). These are your standard plastic safety door knob covers. The cover is made of two separate pieces that snap together to wrap around the entire doorknob. To take the cover completely off, simultaneously push the buttons on both sides, and the two pieces click open. Though there are several different brands of plastic round doorknob covers, many reviewers seem to like the Munchkin brand best. That said, if you have a kiddo who is hell-bent on escaping, it will probably only be a matter of time before he or she is able to break or snap off this cover–it is just plastic, after all. *To combat this common issue, several users discuss DIY solutions to make this product more durable/last longer. One such idea to prevent your child from snapping it or breaking it off the door is to wrap duct tape around the front and back of the cover, being careful to avoid the finger holes. These well-liked doorknob covers fit on most standard-sized round doorknobs and are very similar to the Munchkin covers discussed above. 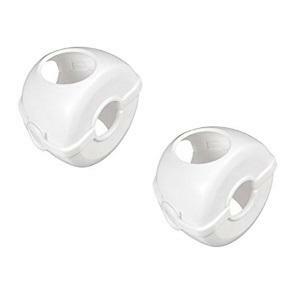 They click easily click into place around your doorknobs. 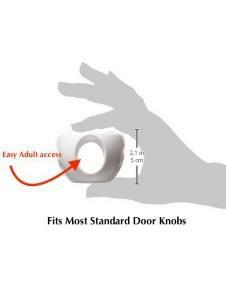 Like the Munchkin covers, in order to operate the door with these covers on, adults must put their fingers through the holes to grasp and turn the doorknob. These are highly-rated, and many say they work better than other brands they’ve tried. That said, some reviewers do report that their littles were still able to break them off. If this happens to you, you can always duct tape the sides to make them tougher for toddlers to open. On the flip side, a few grandparent reviewers say that these are quite tough for them to use because they lack the strength needed to turn a doorknob using only their fingertips. The Door Monkey is a super innovative and versatile childproofing product. It’s a way to prevent kids from opening all kinds of doors—those with round handles and levers—and serves as a pinch guard, preventing kiddos from getting their fingers stuck in doors and hinges. There is not a parent in the world who hasn’t had this happen to their child — it is excruciatingly painful. To use, just clamp the Door Monkey onto the door (Note: you can do this at any height you desire, so if you have an older child who will need access to the room, you can clamp it lower so he can remove the Door Monkey as necessary). Because it keeps doors slightly ajar (which is why it prevents pinches), it also helps air circulate through the room. To unlock the Door Monkey, you just pull the “tail” (pictured below). When you take the Door Monkey off, you can hang it on the doorknob until you’re ready to use it again. Easy peasy. Overall, this is a really great option to keep kids out of certain rooms, and also to prevent them from getting their fingers caught in the door. But, it may not be the best choice for doors you do want to fully close — like the door to the bathroom (um, can I get some privacy in here please?!). This is another unique solution for parents who are also cat owners. Similar to the Door Monkey, Door Buddy keeps the door open wide enough for the cat to sneak in and out, but not for baby! It has an adjustable strap which allows you to crack the door as wide (or narrow) as you want. This particular version also comes with a foam door stopper to protect little fingers from being pinched or slammed in a door. While most reviewers really love this product and say it works well, some do report that it’s easy for toddlers to pull off…and that when they do, the strong 3M VHB adhesive tape it’s secured with takes the paint (and in some cases, drywall!) right off the wall. Eek. So your kid can break off every doorknob lock known to mankind. She has superhuman McGyver-like skills and you are ready to wave the white flag and admit childproofing defeat. But, wait! Here’s a product that just may work for even the mightiest of McGyver-like munchkins. 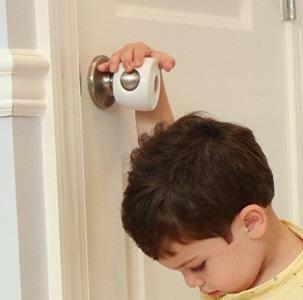 The Safety Innovations Top Door Lock rests on top of the door so kiddos can’t reach it. I repeat: your kids can’t reach it! In addition to the fact that tiny Houdinis can’t reach, break or open this lock, reviewers also like that you can open and lock it from both sides of the door. It fits all standard interior doors up to 1 3/8 inch thick. In order to install this door lock, you first need to screw the peg into the door frame. Once the peg is in, you just slip the latch on the top of the door frame and slide it around the peg to lock it (and slide it off to release). If you’re short like me, it comes with an extension wand to attach to the latch so you can easily slide it without having to use a step stool. Door Guardian is a really cool product because it serves double-duty: it keeps kids IN and unwanted intruders OUT. This all-in-one childproofing and home security lock can be applied to all exterior doors, and effectively works to prevent your littles from being able to open the door and wander outside; when Door Guardian is in lock position, no one can enter from the outside of the house, either. In fact, one user (who described himself as a large guy) said that after he installed the Door Guardian, he tested it by pushing on his door as hard as he could—to the point of almost damaging it—and the door didn’t budge at all. When it comes to keeping your kiddos safe, check out this video that shows exactly how Door Guardian works. Most users say Door Guardian is easy to install, and that because it’s placed high up on the door hinge, little people can’t reach it (and even if they could, they wouldn’t be able to operate it). Adults simply need to slide the outer part of the lock out and open to unlatch the Door Guardian (see visual below). Door Guardian comes in 6 colors (black, brass, satin chrome, white, antique brass and antique nickel), and people love that it’s relatively attractive (or rather, not unsightly…) and very durable. That’s it for now, friends. I hope we’ve helped you find a solution that works for you. And if all else fails, you could simply try a standard hook/eye lock, or call a locksmith to put locks on the doors you don’t want your kids to open. (Seriously, tho). Good luck!